Click the “start” button to scramble the pieces. Drag the pieces to their proper locations. When in the proper location, the piece will snap and lock in place. If the puzzle is too challenging, the “Solve” button can be clicked to move all the pieces to their approximate locations. The “Names” button will turn on labels so that each piece has the state’s name on it. There’s a good chance that your child can’t read yet, so to make it more fun, I used my kids to say the names of the states when each state is selected. 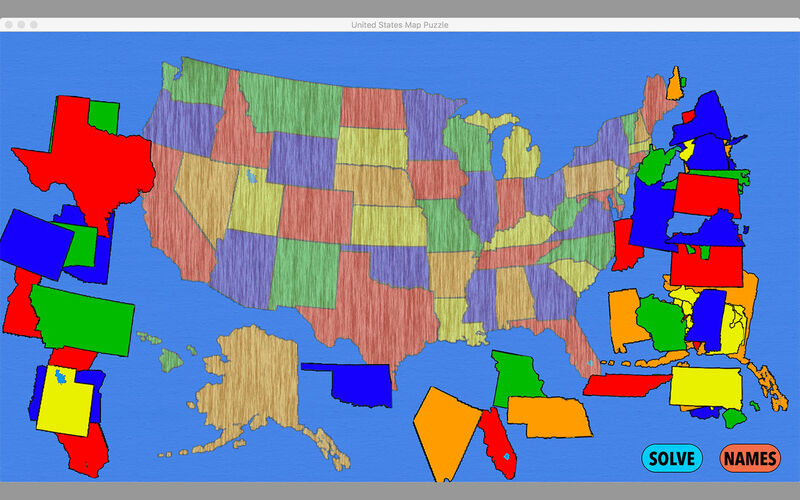 The United States Map Puzzle app is available on iOS and macOS in the App Store. Also check out our US Geography quiz app.